Data abuse has “darkened” technology’s potential, the EU’s Competition Commissioner has warned. 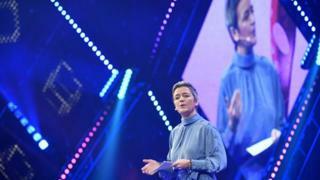 In an interview for the BBC’s Today programme Margrethe Vestager criticised the tech giants for misusing data and failing to respect citizens’s rights. New EU rules governing what could be done with data provided some protection, she said. But she added that the need for more concerted action was becoming pressing. “Over these 12 months our relationship with tech has both been darker and more muddy because it becomes increasingly clear that all the bright and shiny positive potentials of tech are at the risk of being darkened by forced misuse of data, manipulation, supervision, no respect of the citizen, no respect of individual rights,” she told Martha Lane Fox who carried out the interview. Baroness Lane-Fox, who is a board member of Twitter, is guest editor of this morning’s Today radio programme on BBC Radio 4. The tech firms’ actions had changed views about how the industry could influence people and society, said Ms Vestager. The EU’s General Data Protection Regulation, which came into force in May 2018, gave people new privacy rights and more control over their data, but more work was needed, said Ms Vestager. The civil service was now talking about ways to force tech firms to be more “transparent” about what they did with data gleaned from people’s uploads, shares and views, she added. But Ms Vestager described herself as being positive about the future. “One thing I do hope over the next 10 years is that we get a much more… transparent way of dealing with data and giving access to data,” she said. But failure to act, Ms Vestager cautioned, could lead to situation in which one or two massive firms dominated use of our personal data. Baroness Lane-Fox asked if this meant that the commission would take concrete steps to break up monopolies or tackle markets where dominance stifled competition. Commissioner Vestager responded that while dismantling companies had served Brussels well in the past, the speed at which changes occurred in the tech sector made it a less appropriate response. Instead, she said, the commission might look at how larger firms got access to data and resources in a bid to limit their power. Regarding Brexit, Ms Vestager noted that European competition authorities had become stronger by working together. But she added that the UK had “clever skilled people with a very strong dedication” to making sure the market served consumers.